If you are eating gluten-free then you MUST make these rolls. They are good, seriously. And non-celiacs agree; it’s not just me thinking that they are good just because I want to eat a piece of bread! I admit, it takes some effort, although not as much effort making bread with wheat. The recipe calls for millet and oat flour, which can be hard to come by. I have been grinding my own flour with my new VitaMix and it’s amazing. I can grind the flour in less than a minute. If you don’t have a VitaMix, buy the flours (be sure they are all certified gluten free), or grind the millet and oats a blender, it will just take a a few minutes to get flour. Also, the rolls need to rise for about 2 hours, so you must plan ahead. The rise time makes these rolls a weekend indulgence for me. That’s where the effort ends. Throw the ingredients into the mixer for a minute or two, let the dough rise, form into loaves or rolls, place in the oven and you are done. 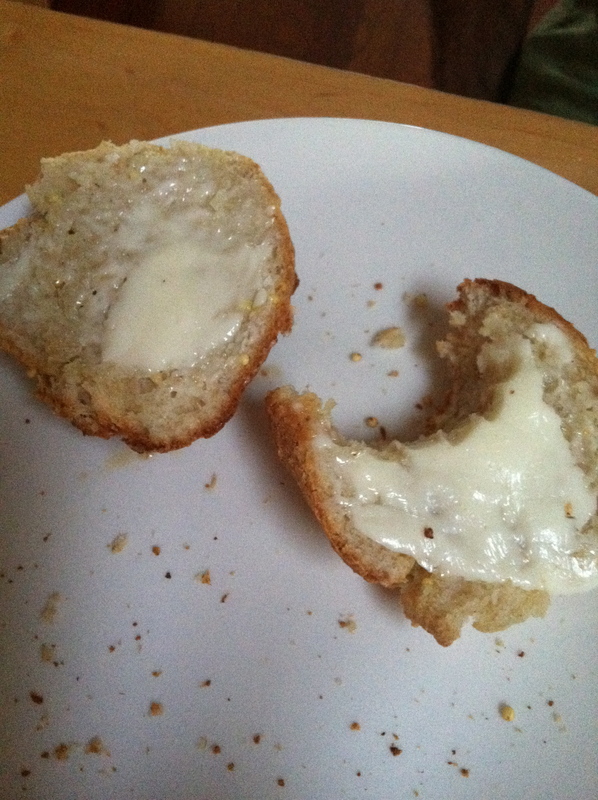 25 minutes later you will be enjoying a tasty, crusty-on-the-outside, soft-on-the-inside roll. I can’t take credit for this recipe. It comes from the “Gluten Free Girl and the Chef” cookbook. It’s posted online elsewhere so I don’t feel badly re-posting it here. This is a great cookbook for those that like to cook. It is such a pleasure for me to open a cookbook with beautiful pictures and delicious recipes that are entirely gluten free. Not only are these tasty rolls, but they are also 100% whole grain, something hard to come by with gluten-free baked goods. The author notes that you may vary the flours used somewhat, but use weight measurements rather than cup measurements. Mixing the dry ingredients. Put the potato starch, almond flour, oat flour and millet flour into the bowl of a stand mixer. Whirl them for a moment or sift the flours together in a large bowl. Add the yeast, xanthan gum, guar gum, and salt. Stir to combine. Adding the wet ingredients. Pour the warm water, eggs, canola oil, and honey into the dry ingredients. Add herbs, if using. Mix with the paddle attachment for a few moments until the dough has fully come together. It will be soft. It will sort of slump off the paddle. Don’t worry, that’s the right texture. Letting the dough rise. Put the dough into a large, oiled bowl. Cover the bowl with a clean cloth, then set in a warm place. Let the dough rise until it has doubled in size, about 2 hours. If making rolls, let rise for an hour, then make rolls and let the rolls rise another hour on your baking sheet. Use wet hands to form rolls to prevent sticking. The risen dough will have a texture closer to traditional bread dough than the unrisen dough had. Preparing to bake. At the end of the rising time, turn the oven to 500 degrees. If making bread, cut the dough in half and form two small boules. Make three 1/4 inch deep cuts on the top of the dough. Baking the bread. If you have a pizza stone, put the loaves directly onto the pizza stone, otherwise place on a baking sheet on parchment paper. Place rolls on a lightly oiled baking sheet. Bake bread for at least 30 minutes, rolls for 25 minutes, or until the bottom of the bread is brown and has a good thump to it. The internal temperature should be at least 180 degrees. Allow the bread to cool for at least 30 minutes before slicing it up. In typing up the recipe, I realized that I forgot to add the eggs today. So if you are looking for a vegan recipe or an egg-, dairy-, and gluten-free recipe, you’ve got one! I thought the rolls turned out better than usual today. Wetting your hands to handle the dough really works. 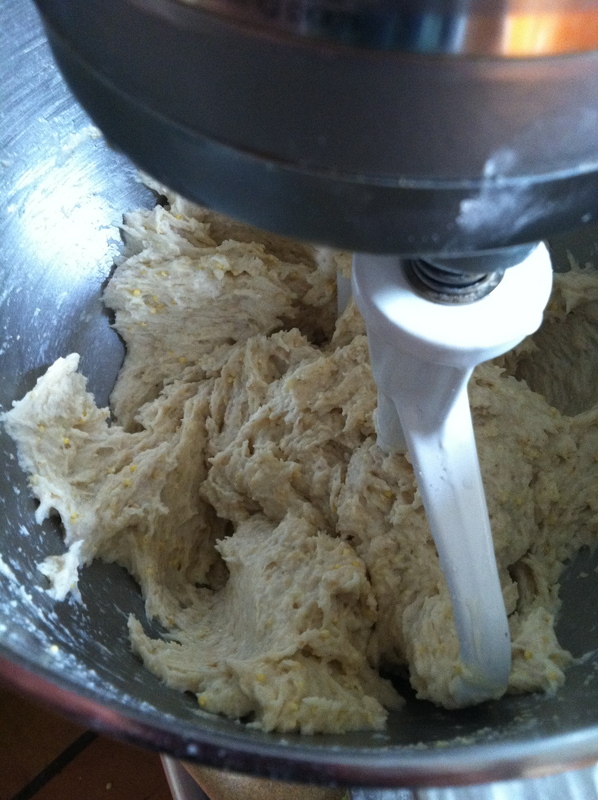 Gluten free dough can be pretty sticky, and wetting your hands keeps the dough moist and not sticky. I use 3 teaspoons xanthan gum because I don’t keep both xanthan and guar gum on hand. It works fine. I’ve used red quinoa instead of millet it made a more flavorful roll. These are hearty sized rolls; you could easily make them smaller. Don’t Mess With My Thankgiving!